There are basically two types of kitchen towels that you might be using. They are listed here, as well as directions for cutting out the design portion to use in your pillow cover. For towel type A., cut the hem or fringe off each end of the towel. Measure the towel's length from end to end to find the center. Make marks at the center and cut the towel in half along the center line. Now, measure the towel's width. For towel type B., cut the hem or fringe off each end of the towel. Find the part of the towel design that you want to be the center of design. From the center point, measure 7" horizontally, toward each side edge of the towel and make marks. From the center point, measure 5 1/2" to 6" vertically (whichever better fits your desired design), toward each end of the towel and make marks. Cut out the design along the marks. You should have a piece of the towel measuring 11" or 12" high and 14" wide with the design pattern centered on your cut piece. Fabric Pieces needed for a cut towel design of 11" x 14"
Cut 2 strips measuring 14" long and 4" wide. Cut 2 strips measuring 16" long and 2" wide. Cut 2 pieces measuring 16" long and 11 1/2" wide. Fabric Pieces needed for a cut towel design of 12" x 14"
Cut 2 strips measuring 14" long and 3" wide. Lay out your towel design piece, right side up. Pin the 14" long strips along the top and bottom of the towel design piece, right sides together, as shown in figure 1. Remove the pins, open out the fabric and press the seams open. Next, pin the 16" long strips along each side of the design front, right sides together, as shown in figure 2. Remove the pins, open out the fabric and press the seams open. Set aside. For each of the back pieces you will need to make a finished edge or a hem. Lay out one of the 11 1/2" x 16" pieces, wrong side up. Fold in one of the 16" side edges 1/2" and press. Then fold the same edge in again, 1", and press. Pin the hem in place and stitch 1/4" from the inside edge. See figure 3. Make the same finished edge or hem on the other back piece. Bring one of the finished edges over the other. Adjust the placement of the uppermost piece so that the final measurement from one side to the other is 16". See figure 4. Pin the two pieces together at the top and bottom edges where they overlap. Stitch the two pieces together, 1/4" from the raw edge. Lay the front piece out, right side up. Lay the back piece over the front piece, right sides together. Stitch around the whole pillow, pivoting at the corners. Clip the extra fabric off of the corners. Turn the pillow right side out and lightly press the edges of the pillow cover. Insert a 14" square pillow insert. You can add a button and buttonhole, a snap, or some velcro to the middle of the pillow cover back opening to keep it closed during use. 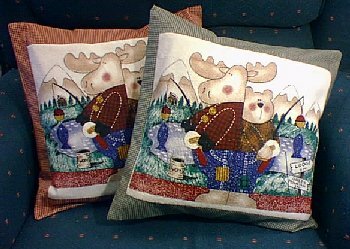 Turn cross stitch projects, fabric prints or other designs into pillow covers using these same patterns and directions!